40pcs 3/8" & 1/4"Dr. Socket Wrench Set. 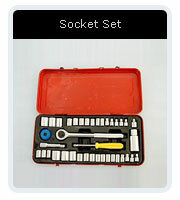 Product Name : 40pcs 3/8" & 1/4"Dr. Socket Wrench Set. Carbon Steel Without Heat Treated. Copyright © Chief Ling Enterprise Co., Ltd.